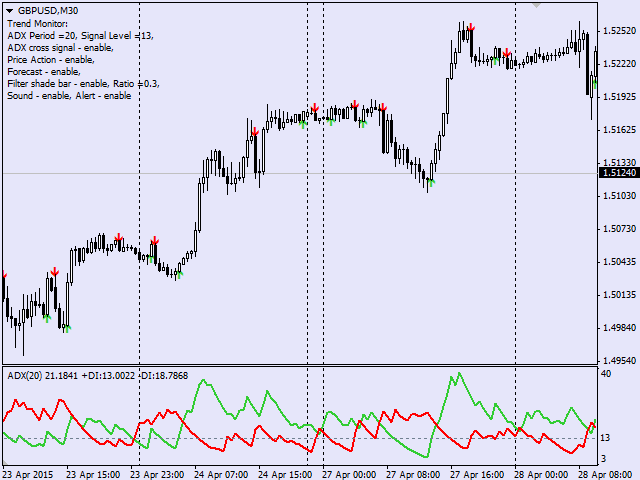 The indicator generates early signals basing on ADX reading data combined with elements of price patterns. Works on all symbols and timeframes. The indicator does not redraw its signals. You see the same things on history and in real time. For better visual perception signals are displayed as arrows (in order not to overload the chart). 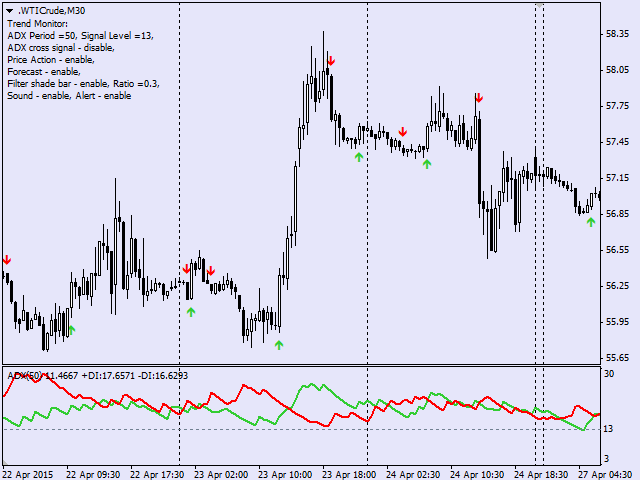 The best results are obtained when the indicator works on two timeframes. 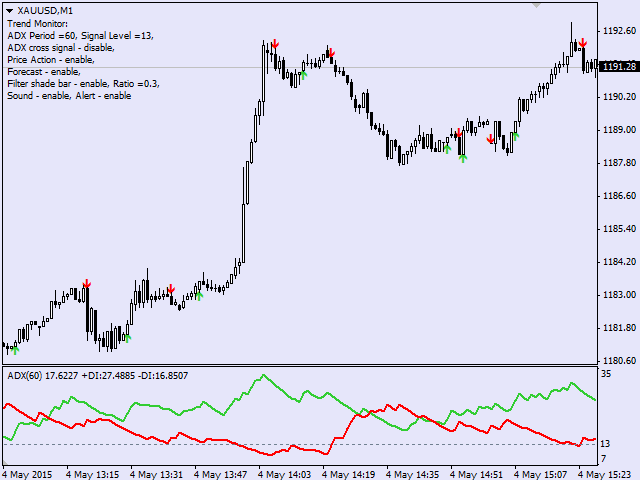 For example: M30 – the indicator shows the main trend; M5 – the indicator generates signals of entry in trend direction determined on M30. It is recommended to use the indicator during session movements to reduce the likelihood of falling into flat. Easy to use. Filter configuration only requires selection of sensitivity in the "Sensitivity of the indicator" input. The signal is given not only when the bar is closed (formed signal), but also on the current bar which is not closed yet (probable signal) - the "Enable the possible signal (on the current bar)" parameter. The indicator sends emails and push notifications to mobile devices. 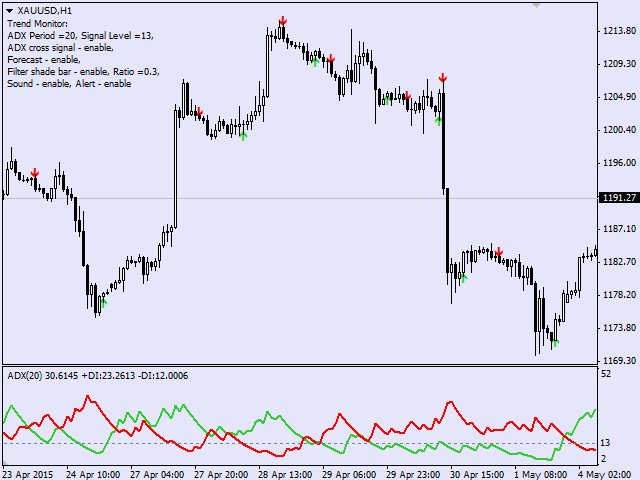 High sensitivity (more signals) - good for higher timeframes (H4, D1 and higher). Medium sensitivity (optimal signals) - best parameters for M5-H1. Low sensitivity (accurate signals) - for M1, M5. 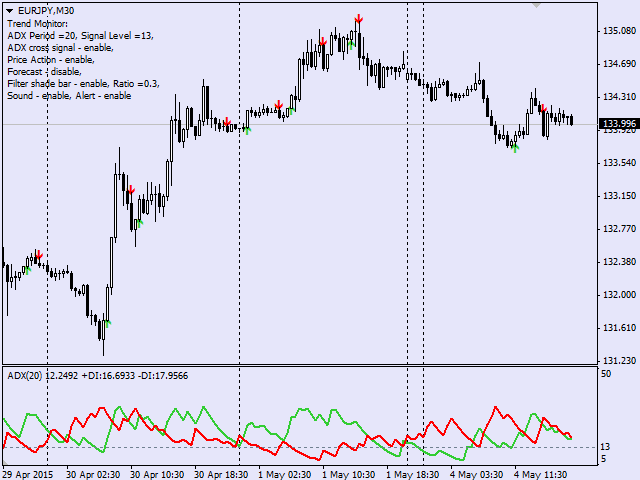 Enable the possible signal (on the current bar) - enable/disable signal on the current incomplete bar (probability signal). 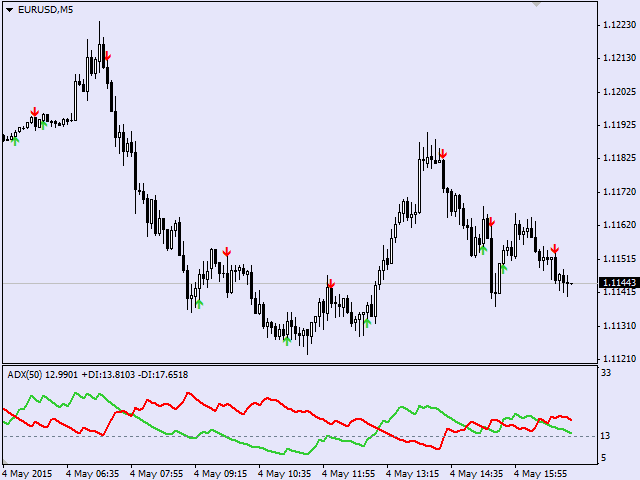 Use signal filter by Moving Average - filter signals using the Moving Average (Disable - no filter, Enable - use filter, Enable and Show filter - use filter and display the MA). Period of Moving Average - the period of the Moving Average used as a filter. The averaging Method - the averaging method of the Moving Average used as a filter. 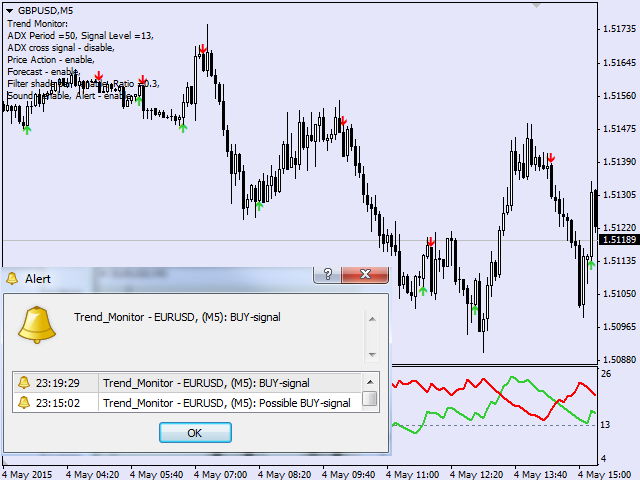 ON/OFF-Draw the arrow of the trend - show/hide a trend arrow in the upper right corner. Color of Up-trend - the color of the signal arrow for the bullish trend. Color of Down-trend - the color of the signal arrow for the bearish trend. ON/OFF - Alert - enable/disable in the terminal when signals emerge. ON/OFF - Mail - sending emails. ON/OFF - Push - sending push notifications to mobile devices. Language – language of messages (English or Russian). I have an idea that whether this index can show the trend of big cycle in short period, for example, if the hour arrow is downward, then I will filter up arrow tips in the fifteen minute chart. Всем привет! Отличный индикатор прост в использовании, сигналы не перерисовывает. Тестировал демо версию на фунте очень четкие хорошие входы, сейчас прикупил полную версию буду смотреть на остальных парах. Павлу огромное спасибо за такой индикатор рад такой находке! 1. Added a Moving Average based filter. 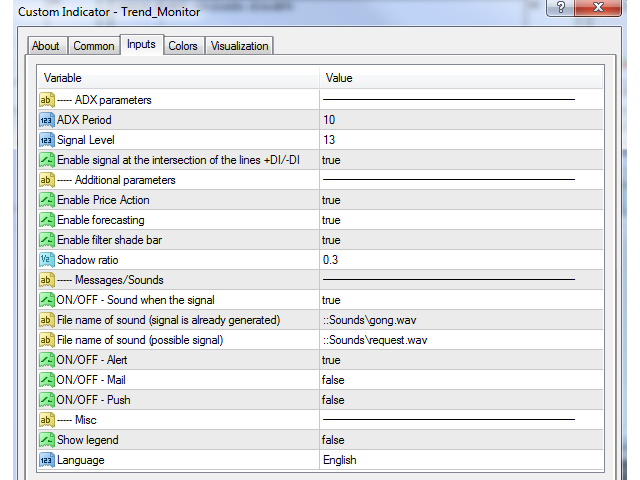 "Use signal filter by Moving Average" - enable filtering of signals (possible values: "Disable filter" - no filter is used; "Enable filter" - signals are filtered using MA; "Enable and Show filter" - signals are filtered using MA and shown on the chart). "Period of Moving Average" - indicator parameter. "The averaging Method" - indicator parameter. 2. In the signal filtering mode, the direction of allowed signals is shown as an arrow in the upper right corner. 1. New parameter "Enable the possible signal (on the current bar)". It disabled a potential (probable) signal on the current incomplete bar. In this mode, the indicator produces a signal only on a closed bar. 2. When a signal occurs, the time of the signal bar is now added into a message. 3. Indicator's Shortname now correctly displays the sensitivity. Added some further improvements. According to your feedback, the indicator still remained too sensitive leading to false opposite signals on good trends during small rollbacks. All filters have been considerably revised. Besides, the entire range of the filter settings has now been reduced to a single parameter - sensitivity. "High sensitivity" - signals are similar to the previous version by their frequency. Recommended for higher TFs (M30-D1). "Medium sensitivity" - the filter parameters most efficient for TFs M5-M15. "Low sensitivity" - for M1. The new version features the candle size filter. The idea is that trend reversals usually occur during strong movements when big candles are formed. Small candles mostly indicate the flat market. The filter effect can be clearly seen during the night flat. The filter is enabled by the 'Enable Candle Size Filter' parameter and configured by the 'Candle Size Ratio' parameter. The recommended values are from 0.6 to 1 (the greater the ratio, the lesser the amount of signals).